While living in our little semi-urban house here in Kumamoto, Japan, we are often visited by one of the neighbor ladies bearing gifts of whatever is in season in her well-tended garden. In spring, there are strawberries. In summer, eggplants and tomatoes. 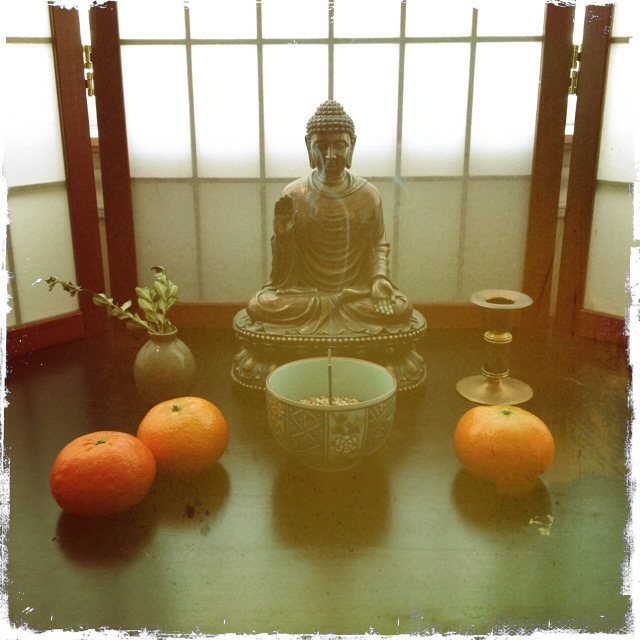 In fall, persimmons and squash. In winter, oranges. These fruits and vegetables then sit before the Buddha on our altar as an offering—for a short while, anyway—before winding up in our kitchen to be duly prepared and then consumed by the family. I’ve always been struck by this neat little cycle of generosity: neighbors sharing their bounty; our family engaging in ritual at the altar; my husband and I preparing meals in the kitchen; and the four of us then eating in proxy for the Buddha, just as it’s done in many households and monasteries throughout Japan. It’s idyllic. Almost. It’s that last part where my genuine feeling of generosity too often breaks down and becomes complicated. 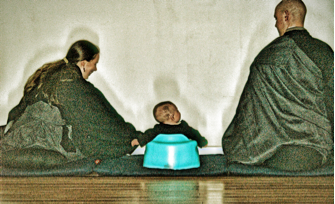 The fact is, mealtimes with young children can be very, very challenging. Lately, with our children at ages 2 and 4, there have been variations on this experience. It’s Saturday or maybe Sunday. It’s been a work-intensive week or two and I think, Gosh, we’ve been having a lot of hasty meals lately. Nutritious enough, but not much pizazz. I want to give my family something special today, something that requires a little extra effort. And so I manage to gather the ingredients at trendy and expensive foreign-food shops—let’s say for a labor-intensive vegetarian lasagna that the whole family has expressed delight over in the past. I wash, slice, saute, boil, and season to perfection. I add to this a salad—various greens, crumbled goat cheese, pecan slivers, sliced and pitted red grapes, a homemade herbed dressing. I toast thick slices of bread (that I have baked myself!) smothered with butter and crushed garlic. A bowl of oranges from the altar rounds out the visual appeal of the meal. I dish up the food, place the plates on the table, and stand back to take in the full effect. It is beautiful. It smells wonderful. The portions are age-appropriate, pleasingly colorful, and arranged just so. I know it will be delicious. Yes, this is the meal that will make my family happy. Generous, I think. I’m feeling so generous today. A very good Mama. My beautiful and perfect family then tumbles into the dining room and. . . my dream ends. Boy thought we were having pizza (“But you said it was a ‘special’ dinner!”), and he sits in his chair and begins to whimper at an increasingly higher pitch. Girl suddenly launches into a screaming tirade because her (carefully cooled) food appears to be steaming. Just a little. The end result of all of this, of course, is that not only do I not feel particularly generous during these moments, I also feel kind of pissed. I think, Hey, I worked REALLY hard for you all today—and this is what I get? Whenever I arrive at this point, this feeling of injustice, I bring myself back to that Zen ritual of generosity: three oranges from a neighbor’s garden placed on an altar, hands held together in gassho, a single bow, that simple sense of “I offer this.” And that is all. There is no expectation in this practice. How can there be? Obviously, the Buddha statue is not going to become animate, leap up, peel an orange, and tear into a juicy wedge (though, boy, that would be something!). Nor is the statue going to reject it. You know that it’s just ritual, and it’s easy to be generous and have no expectation within those boundaries—that’s why it’s such a wonderful starting point. The challenge, then, is in sincerely bringing this view of “no expectation” to our dinner table, glass-shattering screams and all. That is not to say, of course, that I do not want my children to be aware of the effects of their behavior. I do want them to be thoughtful and polite, to practice gratitude for the generosity of others. But in order to convey this instruction to them skillfully as a parent, I need to let go of my expectations. I know I can’t be as skillful from a place of anger and resentment. By the end of the meal this time, the children have at least said their thank-yous and tasted the food.Tomorrow—who knows? They will probably request and then eat the leftovers. . . and be truly, truly upset when I explain that I cannot offer thirds because Mama and Papa ate that for their lunch already. Because it’s just like that sometimes. After dinner, my children rush off and away to play, somehow happy again. I see that Girl has marked her orange slices by inserting each into her mouth—the withered edges and teeny-tiny teeth prints give away her act of blessing. And so I eat the mutilated oranges as I wash dishes, feeling grateful for that fleeting sweetness. It turns out that I am today’s proxy for the Buddha. The cycle of generosity is complete.